A two-year-old stray dog is in love with his new owners after they adopted him, and these viral photos show why! 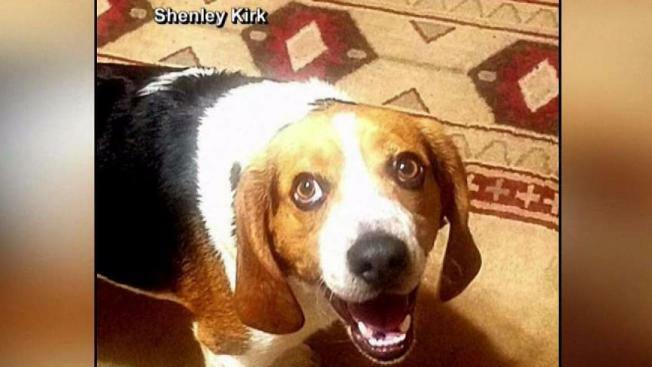 They’re the words of an Ohio shelter founder who help saved Gregory the dog from death row. Gregory was slated to be euthanized at the Franklin County Dog Shelter in Columbus after testing positive for heartworm, according to rescuers. Schenley Hutson Kirk, who co-founded HOUND Rescue and Sanctuary, helped rescue Gregory before the dog was euthanized. She shared a photo of the pooch leaving what could have been its final home. The caption was accompanied by a photo of Kirk’s husband, Joe, driving Gregory on a “freedom ride.” In the image, Gregory is seen nuzzling Joe’s shoulder with a paw on Joe’s arm. Joe told "Today" he drove two hours to pick up the dog, saying the moment he met Gregory it felt like they "known each other for years." Normally, the shelter transports dogs in crates, but Joe told "Today" he felt Gregory had been caged up for too long and chose to instead tether him in the back seat. The post has been shared more than 9,000 times since it was posted at the start of the month. Kirk has asked for donations to help with Gregory’s treatment, which can be made here. The couple said the shelter already has an adoption offer for Gregory since the post went viral. Once the dog is cleared by a vet, the adopters will have their first meet and greet with what could be the newest member of their family.